What exactly is your goal? To do copycat shots of famous sights, done to death a gazillion times? If yes, than searching for a book how to do it is the right way to go. If, however, your goal is to capture your own vision of the city, forget about books and tripod-hole guides, and just wander around the city, see how you feel and shoot whatever catches your fancy. There is no way you are going to miss some iconic sights, just because there are so many of them, but at least it will be spontaneous and yours. There is an old amphoto travel guide on photographing paris by Albert Moldvay and Erika Fabian. Although it was published in 1980 it is quite decent and I didn't notice much that had changed (visited in fall 2011). You will probably have to find it used. Although the book literally has "tripod marker" spots, I tend to ignore that information and just use it as a scouting report to help with planning my day/trip. You may also want to look at the DK travel books. Although these are not specifically for photographers they tend to have lots of pictures/diagrams that can also help with planning. I could recommend you the historic center (let's say 1st to 6th arrondissements or so : Louvre, Marais, Ile St Louis, Quartier Latin), but you may also love the northern parts of the city (Montmartre, Belleville...). Hard to tell without knowing you ; you may plan to stay at least a few days, of course. But, I'm with Slobodan and Niko, Paris is such a wonderful city for photographers that you shouldn't need any book or guide. Paris is not a huge city (at least the center), but be prepared to walk quite a bit. I'll agree with most of what has been said above. Paris is a great city for street photography - especially in the hour either side of sunrise and the hour either side of sunset. The middle of the day can be less rewarding but possibly still worth keeping your camera ready. They are all great shots but I particularly love Paris II. A little song, a little dance, a little seltzer in your pants. I've spent a great deal of time in Paris and surrouding cities over the years and there some resources that I found are very useful. One is Michael Poisson's book "Paris Buildings and Monuments". This is a remarkable book, and indispensible in terms of locating some of the extraordinary buildings in Paris...and there are hundreds and hundreds...and needless to say "built work" figures into a lot of Parish shooting. In addition to the architecture(that was my work once),a lot of my photographic work dealt with surveying the gardens of Andre Le Notre...and in particular Sceaux. It is a 15 minute train ride from Paris...and if you spent a morning there...I imagine you would find this a fantastic opportunity. There is a link below to some of Le Notre's gardens...with informaton of Sceaux. The website is labyrinthine...so don't miss anything...lot of" submenus/slideshows/interactive timelines...etc.etc.. I always recommend taking a bit of a "breather" from Paris - and spend a morning in Sceaux or St. Germain en Laye e.g.. If you have any questions you can p.m. me. I remember seeing your 'rain' picture before, and it blows my mind this time too. Bloody beautiful. The bridge shot's also a cracker but still falls into a more general category of cityscape art, whilst the third one disturbs me. Is there something wrong with the lens or the PSing? It has a similar sense of perspective distortion, of inverted logic as did another image of a wall with about three levels of window casements (B/W) in another thread here recently. Or is it a trick of the highlighted rooftop fooling my eye? Or is it my eye? 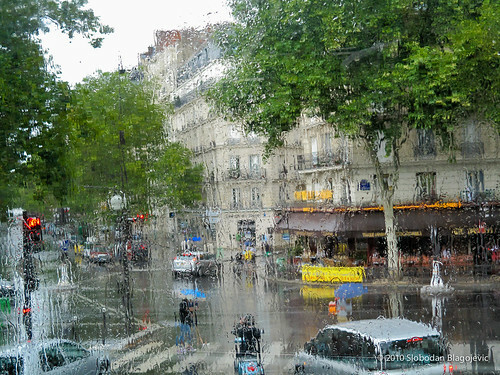 For what it's worth, the rain picture really sums up what appeals to me about photography in urban areas. I have no interest - or very little - in monuments, fountains and other existing works of art: it's the discovery of one's own art caught in that fleeting moment of happenstance that does it for me. (You also did it with that lovely shot into the restaurant from atop a bus.) I only wish I was both ready for it and out there looking for it; but I'm not. Attached is a non-corrected shot. In the OP version, I first established a proper vertical in the middle of the image, and then applied a small amount of vertical perspective correction. I just stopped short of making everything absolutely vertical, as I believe that creates an unnatural sense of perspective. Apparently, I did not succeed. Sorry to force your washing into public view, but at least it wasn't in vain: I think I shall forget all about correcting for verticals in PS, which saves me a lot of mental grief! Grief, because it would probably have meant a move to the latest version when, apart from verts. the old PS6 does me pretty well. It's strange: I can't tell if it's me or the machine, but you may remember that some year or so ago I was having nightmares putting two images side-by-side as a single file. Well, following various bits of advice from readers here, I got the hang of it in PS6 and discovered it was pretty simple to do, and I did, showing a couple of such things here to show my gratitude, as it were. Now, it's impossible. I follow the written instructions again, and it fails to stick the two images together. It must be a jinx all right! Some Jinx! Looking for the joined image, I discovered that another Folder, containing most of my Finished files, has vanished from 2 external drives! Don't ask. I do have most of it on CDs though - I hope! No bloody wonder I love trannies! Woe is me for I'm undone. Anyway, here's what I can no longer do. A chap I know came out on holiday and ran me through it again: problem solved! No problem, but what I am more interested in is: which version, corrected or uncorrected, looks better? From the above, I would assume the latter. What others think? Yes, I like the uncorrected one more, but then find myself forced to ask if you did it on the run or from a moving vehicle; why else be so off the straight? Funny, but none of the above. I was standing on the opposite site of the river, handholding carefully the camera, trying my best to hold the camera horizontally (you know, engaging whatever inner gyroscope or bubble level our brains might have). So, I guess it must be my vantage point and the angle at which I was shooting the building. In other words, even if you put the camera on a tripod and engage a bubble level on it, certain combinations of vantage point and angles would necessarily result in some sort of distortion. Anywhere and everywhere, its one of the most target rich cities in the world. I was blessed with really nice light. pony up taxi fare when moving from one location to another so you don't waste time walking, cause walking just causes you to stop ever few meters to shoot more and you will never get anywhere! a five minute walk from my hotel to the seine, sometimes took me couple of hours! best cheesecake i ever had; Le Nemours cafe, near the Louvre! good luck you'll have a blast!!! Now you see why there are no books - too much to put in! !